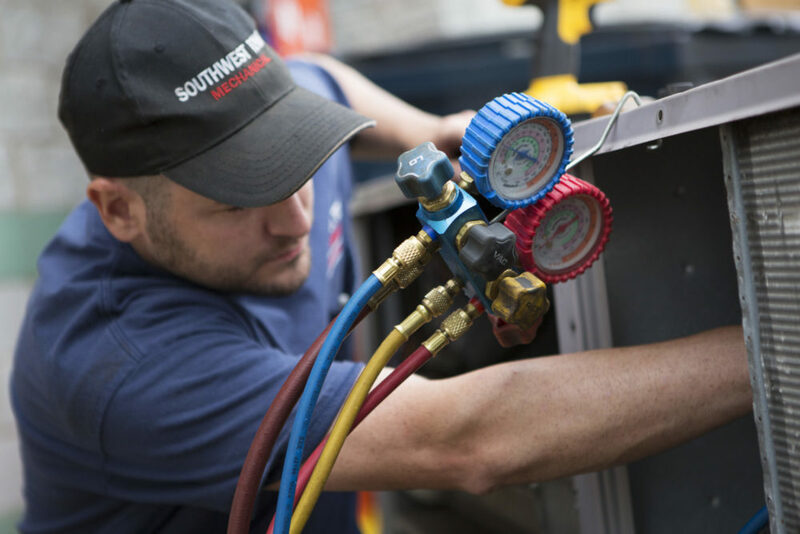 Serving businesses in Wisconsin and Northern Illinois, we keep commercial cooling systems running at peak performance through quality installation, preventative maintenance, and repairs when they’re needed. If you’re looking to schedule quality air conditioning services “near me,” look no further than our team at AccuTemp Mechanical. To schedule commercial air conditioning services in Kenosha, contact us today or give us a call at 262-671-4012. We design/build environmentally friendly, energy-efficient cooling systems for industrial and commercial environments in the Wisconsin and Northern Illinois area. Our air conditioning systems will help you save on your monthly energy bills, eliminate heat generated by technology in your building, and keep your space cool and comfortable for employees and customers. Centrifugal. A high-efficiency option even at full load, these compressors are affordable to install and manufactured in capacities from 200 to 2,000 tons. Screw. This type of compressor is very efficient but can be more expensive than the centrifugal. It includes vibration-free operation and a compact design. Scroll. These are ideal in commercial systems with capacities of two to 60 tons. Reciprocating. These are more common in older applications. Our cooling systems are ideal for manufacturing facilities, computer rooms, data centers, hospitality centers, and other commercial and industrial facilities throughout Wisconsin and Northern Illinois. If your system is on the fritz, or you need a system installed for the first time in a new facility, there is no one more experienced or more qualified to get the job done than AccuTemp Mechanical. To schedule commercial air conditioning services in Kenosha or the surrounding areas with AccuTemp Mechanical, contact us at 262-671-4012 today! We offer customized preventative maintenance plans on commercial and industrial cooling systems for our clients. Regular maintenance is one of the best things you can do for your building’s air conditioning systems. It can minimize unexpected service calls, extend the lifespan of your equipment, reduce your energy bills, and help you avoid downtime that could be costly to your business. When you sign up for one of AccuTemp’s preventative maintenance plans, you can be sure that your system will run smoothly and your business will operate as it should. Want more information about our plans? Visit our maintenance page or read on. If your industrial or commercial AC systems are not operating correctly or efficiently, or if your staff has uncovered a problem, we can provide you with a cost-effective solution. We offer prompt and efficient commercial air conditioning repairs to our clients to minimize your company’s downtime and prevent any damage to your property and equipment that may be caused due to overheating. When you need to maintain, replace, or repair your industrial or commercial cooling system, our certified union technicians are here to help. We can help you get to the root of any problem and implement the most economical solutions for your building’s cooling needs. We specialize in commercial air conditioning for manufacturing facilities, computer rooms, and hospitality facilities—but our services are available to any commercial or industrial building in the Wisconsin and Northern Illinois area. Is your AC system broken? Need immediate repair? Contact AccuTemp Mechanical to schedule commercial AC repair in Kenosha or call 262-671-4012 for questions! Do you need commercial AC services for your business or manufacturing facility in Wisconsin or Northern Illinois? We offer comprehensive services throughout the area, and our service technicians are experts in commercial HVAC systems. No matter what make or model, our certified technicians have you covered. Call today at 262-671-4012 to schedule your industrial or commercial air conditioning service in Kenosha or the surrounding areas!